"Houston, we have a problem." No, not really. Swedish AOR giant Houston (and you thought they were from Texas) returns with their third studio album of completely new songs, aptly called, III. If you've been following along, Houston has established a pattern: cutting an album of new songs, followed by an album of covers (plus a few new ones), then followed by ... you get the picture. Needless to say, III is another platter of typical Houston AOR melodic rock magic. Essentially, they've become masters of the genre in a short seven years, even if the formula is something that sways between familiar and redundant. 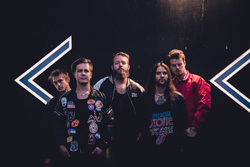 But that's to say, Houston spins all the proper elements of melodic rock: great song melodies, hooks in catchy choruses, smooth vocal harmonies, spry harmonic riffs, bristling and vibrant guitar solos, and a nearly "dance pop" groove from the rhythm section. (That last element may be influenced by producer Martin Karlegard (Reptile Smile) who has a history producing European pop singers.) All these things are then wrapped in simple radio-friendly AOR accessibility. Like the previous II, which featured guitar guru Tommy Denander, the best part of this album and every song may be the killer guitar solos. Ultimately, the Houston sound is both familiar and comfortable, like your favorite wine with a warm blanket on a winter night. As for the songs, excepting a ballad, they all pretty much rock. Some songs come with sharper riffs and a more direct rock approach like Everlasting, Cold As Ice, and Road To Ruin. For a contrast of bristling riffs and that aforementioned dance-pop groove, there's Dangerous Love. Lighter piano begins the song To Be You, suggesting a ballad, but the song enlarges with thicker, denser, parts, gently tempered by synths. A true ballad comes with Lights Out, which is driven mostly by a melodic piano line, with vocals above, then wrapped in synth orchestration. As I said, III is pure Houston AOR melodic rock, easily understood and sweet as ear candy. Recommended. 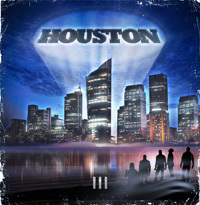 III is pure Houston AOR melodic rock, easily understood and sweet as ear candy. Recommended.